S.A.W. SUPER AGGRESSIVE WORKOUT is an ultra-concentrated pre-workout formula for professionals. S.A.W. SUPER AGGRESSIVE WORKOUT contains the unique complex of beta-alanine, caffeine, L-arginine and creatines. Contains caffeine. Not recommended for children or pregnant women (200 mg per daily serving – 90 ml). Recommended daily portion is 90 ml (6 tablespoons). Drink 45–90 ml (measure out using the measuring cup included in the packaging) 30 min. before planned workout. Begin by taking 45 ml (3 tablespoons) and increase intake to 90 ml (6 tablespoons) as required. Avoid combining with other products containing caffeine! Please note: Do not take before bedtime! WARNINGS: Do not exceed the recommended daily dose. Do not use the product as a substitute for a varied diet. Children, pregnant or nursing woman must not take the product. Do not use the product in case of circulatory system problems or sensitivity to caffeine. Do not combine with alcohol! Varied and balanced diet and a healthy lifestyle are important. The product contains naringenin, which can affect the intestinal absorption of certain drugs, leading to temporary changes in their metabolism. Single intake of beta-alanine in an amount greater than 800 mg can cause tingling and numbness. 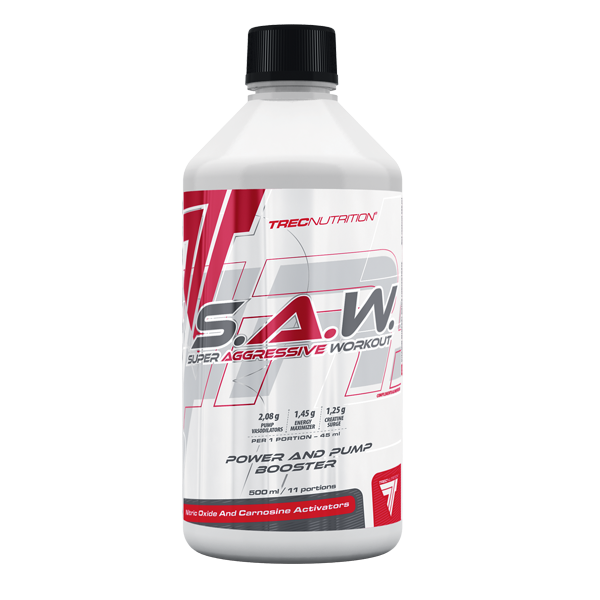 INGREDIENTS: water; SUPER Pump Vasodilators [L-arginine alpha-ketoglutarate; citrulline malate; di-arginine malate; ViNitrox™: grape (Vitis vinifera) and apple (Malus pumila) extracts]; AGGRESSIVE Energy Maximizer [beta-alanine; N-acetyl L-tyrosine; taurine; caffeine anhydrous; grapefruit extract (Citrus paradisi) [98% of naringenin]]; WORKOUT Creatine Surge [tri-creatine malate]; aromas; thickeners – guar gum, xanthan gum; preservatives – potassium sorbate, sodium benzoate; sweeteners – sodium cyclamate, acesulfame K, sucralose, sodium saccharinate; colour – cochineal.